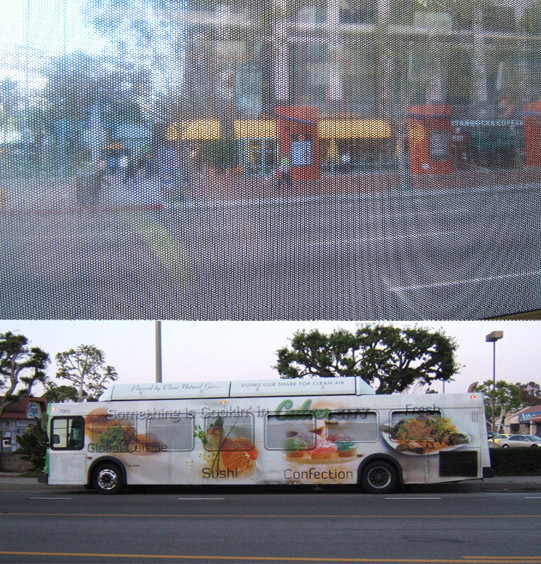 Ever wonder what it’s like to look out the window of one of those buses shrink-wrapped in advertising? This photo gives a pretty good idea. But maybe it doesn’t matter, because you’ll be glued to the monitor running video ads inside the bus, or mesmerized by the print ads covering most available surfaces. After all, by riding the bus you’ve voluntarily joined a captive audience, haven’t you? And where does it say you have the right to enter a public space without being confronted by a 360-degree assault of messages to buy products and services? The MTA and other public transit agencies will eagerly tell you that selling public property as ad space is the alternative to higher fares. So why don’t we wrap the MTA headquarters building, which towers above its downtown surroundings and offers a panoramic view of the city? Why shouldn’t MTA executives and board members have the same kind of view as the riders inside the bus?